Recently, we came through a rough Nor'easter that impacted a lot of travel along the Eastern seaboard. Of course I was flying at this time and my trip changed many times throughout the three days. During crazy weather, cancellations, reroutes, and minimum rest layovers, I have to remind myself why I love this job so much. Perhaps you're thinking about being a flight attendant and wonder what the perks are. Or how we stay in this job for years on end, even though we come across irate passengers, weather delays, and unexpected situations onboard. Well friends, wait no more! LOL. 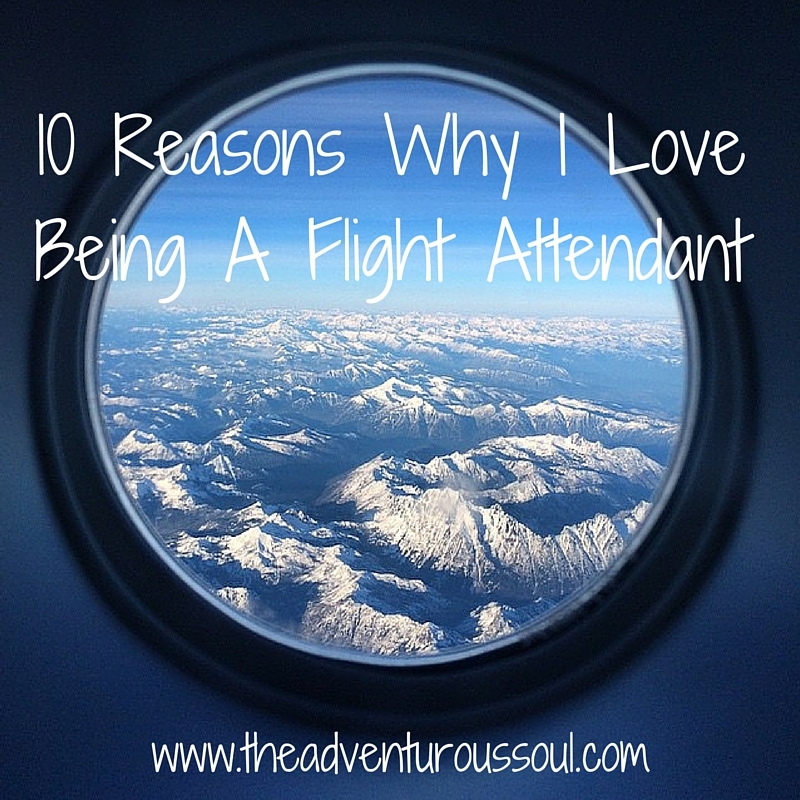 Here are my top ten reasons why I love being a flight attendant. The travel benefits - anyone in this line of work that doesn't enjoy the travel benefits is lying ?. Whether it's a once-a-year trip to a new destination or deciding to use days off to visit a friend in another country just because, the travel benefits are fantastic. Of course, they vary from airline to airline. But all airlines will offer some sort of free/reduced-fare travel for its employees. Another plus of the travel benefits is the interline rates. Different companies within the travel industry (hotels, resorts, cruises, etc) will give discounted rates to airline employees. That makes the travel even easier on the wallet! The different people I meet - I've never flown with the same crew twice. I meet hundreds of new (to me) crewmembers every year. And crewmembers are some of the most interesting people in the world. There are the senior crewmembers that have been flying for decades and have wonderful stories from the "glory days" of flying. There are crewmembers that do other things on the side: photography, personal training, blogging, owning/running a business. I've flown with crewmembers that have overcome great struggles and hardships in their lives and still have smiles on their faces. The different people I meet - Yes, this is the same thing as #2, but this time I'm talking about passengers! I've meet some super awesome passengers, from the million miler that likes to crack jokes with the crew to celebrities (Brian Littrell, Patrick Dempsey, Kate McKinnon to name a few). One time, I was serving beverages and a redhead asked me for a ginger ale, then said, "Is this considered cannibalism?" That one had me chuckling for a few good minutes. Discovering new places - When I have a long enough layover in a new city, I get out there and explore the town. I'll find the local coffeeshops and enjoy my morning coffee there. Find a park or historical site or museum. This has helped me see the beauty in places that I didn't previously know about. Such as Colorado Springs, CO or Columbus, OH. Both of those places surprised me. Nothing is ever the same - One thing that is guaranteed about working in the airline industry is change. Everything will eventually change. Since I started working two years ago, a lot has changed! Being a flight attendant has really tested my sense of flexibility. As I mentioned at the beginning of this post, my trip changed so many times due to the recent Nor'easter. I like change. I'm not a fan of routine because I get bored easily. It makes you prioritize - there's nothing like having a job that takes you away from home for most of the month that makes you realize what is important in your life. I know what my priorities are and I'm careful to protect those. This job has helped me to see which friendships can stand the test of a flight attendant's schedule. An unintended side effect of this job is weeding out the wishy-washy friends in my life. Travel buddies - I have a mental list of flight attendants that I want to travel with. Well, most of them want me to take them to London and show them around my hometown :) I planned a backpacking trip to Ireland with a flight attendant friend and we had a blast! I'm planning another backpacking trip this spring with one of my closest flight attendant friends. It's crazy how close you can get to someone in the span of a three-day trip, but it happens. And I'm thankful for it. Because now I have a whole group of people I'd love to travel with. It's a lot easier planning a trip with someone whose schedule is just as crazy and unpredictable as your own. The flexibility - my schedule is incredibly flexible. If I need to pick up more hours, I usually can. If I don't like a trip that I have, I have the opportunity to change it. I can stay domestic or go international. Even though I'm fairly junior, I am able to improve my schedule whenever I want. It's easy* - (*as long as nothing goes wrong). At the end of the day, I'm arming/disarming doors, setting up beverage/meal carts, serving passengers, and collecting rubbish. Not a very difficult job. I'd say on a normal day, arming and disarming doors is the scariest part because you can definitely do some damage if you're not paying attention to what you're doing. But other than that, it's an easy job. So, there you have it. I have many more reasons why I love my job, but I could be writing for ages! Any flight attendants out there have anything to add? Or non-airline friends that are curious about the job? Drop a line in the comments below!